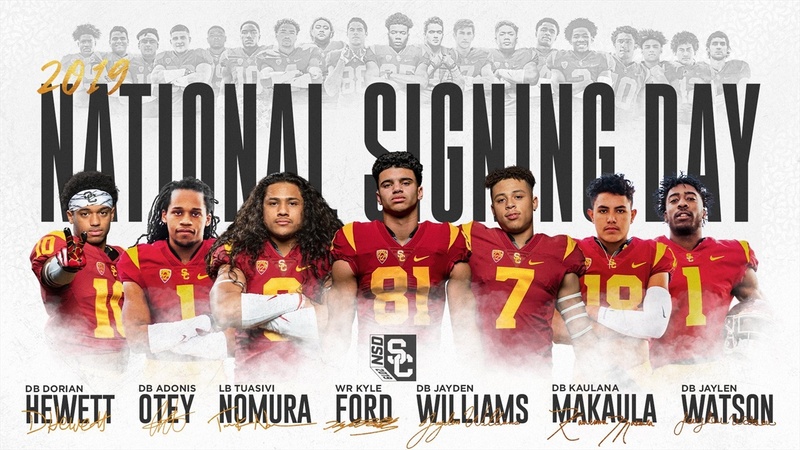 LOS ANGELES – Six high school football players and a junior college player signed letters of intent with USC today (Feb. 6) and will join the Trojan program in the fall, USC head coach Clay Helton announced. Today’s signees join 19 other players who signed in December’s early signing period to comprise USC’s 2019 signing class. Today’s signees are, alphabetically: WR Kyle Ford of Orange (Calif.) Lutheran High, DB Dorian Hewitt of North Shore Senior High in Houston (Tex.